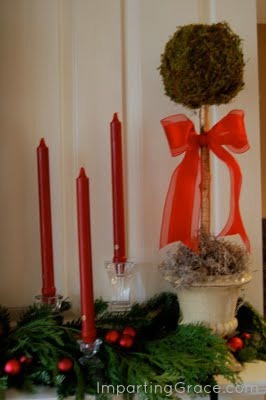 One of my favorite things to decorate at Christmas is the mantel. I was struggling to find something with sufficient height to balance the large painting that's always on the mantel, so I made my own topiaries. It's pretty simple. This painting is always on my mantel, and I didn't want to take it down. So it anchors my mantelscape (is that a word?). As you can see, the stockings are hung by the chimney with care. I splurged on some new red candles which I placed in three different pairs of crystal candlesticks. I used clippings from our Christmas tree and some cedar from the yard for greenery, and I tucked in some little red ornaments. And to finish off the whole thing, I used my moss topiaries. I've shown them to you before, when they were on my dining room table this fall. I really like topiaries. And I really like them in pairs. But I don't like the price of them. So I made my own, and I'll show you how. They were marked $12.99, but I got them on sale at 60% off. Spray your foam sphere with adhesive, then apply sheets of moss to cover completely. Place the florist's foam into your container, anchoring securely. I used gravel to hold mine in place. You could glue yours in place, tape it in place, or even anchor it in plaster. Cover the top of the pot with something decorative (I used Spanish moss), and add whatever embellishment you like. I like a simple bow. Voila! For very little money, you've got yourself a moss topiary! 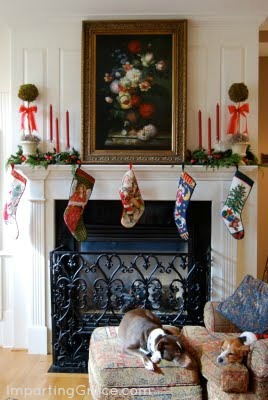 Here you can see who really enjoys my Christmas mantel the most: Snickers (the beagle) and Cocoa (the pound puppy). They love this chair and ottoman, especially if there's a fire going. 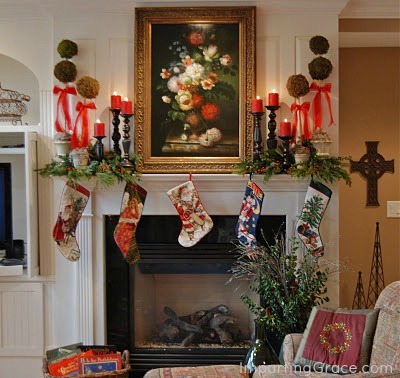 Your mantle is absolutely gorgeous! The last picture looks like it came out of a magazine. Your topiaries turned out great too. I have never made them, but with your directions, I think I can! "So take your moss-covered ball and impale it on a stick." 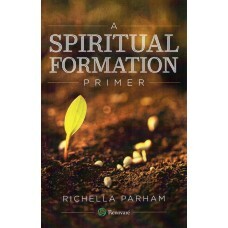 Something about sweet Richella and this aggresive-sounding sentence in the same thought just cracked me up! Your home is so beautiful, Richella. I am not crafty, but I am going to try this because you used the word impale. And the irony of it all delights me. Thank you for sharing. I've always wanted to know how to do that. I bought some spheres, but that's as far as I've gotten. I appreciate it, you are a dear! Your mantle looks great. I am in love with topiaries and have been wanting to make some of my own. Thanks for the tutorial! So cute...the topiaries and dogs!! Thanks for the great tutorial. Love this! Richella, that last photo looks like something out of a magazine!!! Lovely. :) Your mantelscape (why can't that be a word?!) is fabulous. Thank you so much for your VERY kind comment today. It made my afternoon. I do think it's important to make an effort to visit at least a few other blogs if you're going to link up to a party, since that's sort of the point. It has been frustrating lately when I take the time to read and comment, and some people just don't return the favor. It's different if you're a "Big Mama" or a "Nester" or "Thrifty Decor Chick" or something. I don't know...I guess it just rubs me the wrong way. Your topiaries look fabulous and referring to them as moss lollipops made me smile. Your mantlescape looks great! Very pretty! Your mantle looks beautiful. I love all things mossy and this is no exception! You could adapt these to use all year 'round! Great job, I'll have to try it. I love topiaries, also. The urns are gorgeous! Love what you have done. Love it,you are always so creative :)!! Very pretty! Thanks for a great tutorial. 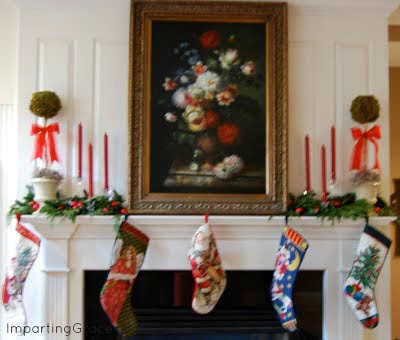 Your mantel looks so pretty! You know I love red so I love the red candles with the red bow on the topiaries (those turned out great)! 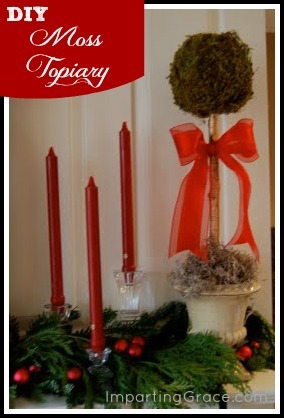 I love topiaries too and you're so right they are usually very overpriced. So this is perfect!